The investment company DPW Holdings has announced plans to spin off its crypto-mining business, Super Crypto Mining. It says it will pay a special dividend to shareholders of at least 80% of Super Crypto’s common stock. DPW shares spiked more than 25% ahead of Monday’s opening bell. Watch DPW Holdings trade live. 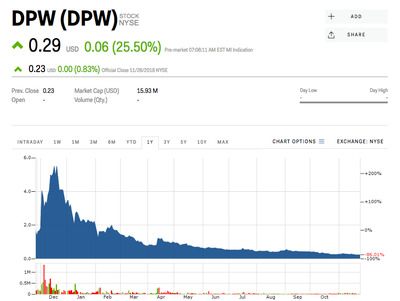 The investment holding company DPW Holdings was soaring ahead of Tuesday’s opening bell, its shares up more than 25% at $US0.29, after the company said it was spinning off its crypto-mining business, Super Crypto Mining. DPW said it planned to pay a special dividend of at least 80% of Super Crypto’s common stock to DPW shareholders, allowing them the opportunity to own a “pure play” crypto company. “We are confident crypto-mining and the cryptocurrency marketplace will flourish in the long term and think there is significant value in Super Crypto and its various initiatives which require the ability to finance their growth independently,” DPW’s CEO and chairman, Milton “Todd” Ault III, said in a press release. It has been a tough year for digital-currency investors, who saw prices explode in 2017 as cryptomania swept over the world. Bitcoin, for example, began 2017 worth less than $US1,000 a coin before soaring more than 2,000% to a high of $US19,511. This year has been a different story, however, with the cryptocurrency’s value having plunged by more than 70% to less than $US3,700. 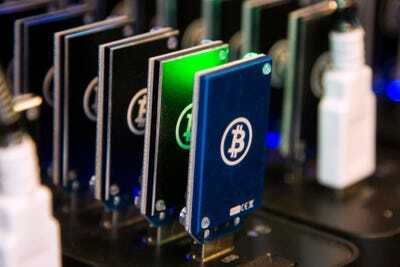 “This transaction positions Super Crypto Mining for a bitcoin recovery,” Ault added.